Please look at the following image carefully, it’s an intelligent head unit from Seicane specially made for 2007 2008 2009 Mazda 3. 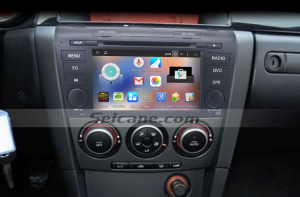 This Mazda 3 head unit is upgraded with the most advanced Android 4.4.4 operating system to facilitate the operation and a strong RK3188 1.6 GHz Cortex A9 Quad-core CPU to enhance the capabilities. If you are going to upgrade your factory radio, it’s an ideal choice for you to take into consideration. 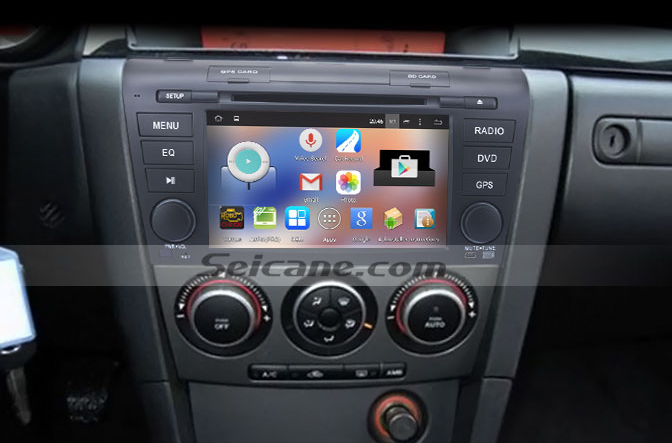 This Mazda 3 head unit can support a variety of features which can bring you a lot of convenience and pleasure in your car, including GPS navigation, CD/DVD player, Bluetooth hands-free calls, Bluetooth music, FM/AM radio, RDS, TV, USB, SD, AUX, etc. It is designed to meet your different requirements on the way. To keep a device for long usage, you need to maintain it constantly. The head unit is no exception. It’s necessary for you to upgrade the software to the latest version, keep the screen and the DVD player clean and so on, so that it won’t easily break down. To help you upkeep your beloved car unit, I’d like to share how to keep a head unit clean with you. After a long-time usage, you may find there are a lot of fingerprints on the screen because you often operate the unit with your fingers. Besides, it easily gets dirty when you often open the doors and windows of your car, therefore, much dust may be easily found on the screen. In that case, you need to clean the screen often. Only a correct way to clean the screen can do help, so it’s good for you to know how to clean it correctly. To clean the screen of a head unit, you should use a piece of soft dry cloth. Remember to clean it as gently as possible. If you find something hard to remove, for example, oil stains, you can use the cleanser to wipe it out, after that, you can make it dry with a piece of soft dry cloth. As a matter of fact, it’s wise for you to add a specialized cover on the screen, which helps a lot on keeping the dirt from outsides. Generally speaking, most car owners will easily neglect the maintenance of the disc player which is inside the unit. However, you also need to upkeep it at intervals. If it can’t work, you’ll lose the function. To maintain the DVD player, you can clean it with detergent once or twice a month. In addition, you can also clean the discs before you put them into the player, so that the DVD laser won’t get much dirt easily. Above all, you should keep in mind that cleaning your unit with a correct way constantly and you can keep it in good condition for a long time. If you have any questions, you can ask your dealer or a professional for help. This Mazda 3 head unit provides a large 7 inch multi-touch screen with 1024*600 pixel resolution for you to view the precise GPS guidance to your desired destination. Thanks to the built-in Bluetooth, you are able to have a safe and cheerful driving by wirelessly pairing your Bluetooth-enabled mobile phone with this unit for hands-free calls and streaming audio. There is also an input for you to connect a backup camera to get help for parking. Just install this popular Mazda 3 head unit in your car and enjoy a different driving experience from now on!